The island of Lombok in West Nusa Tenggara offers breathtaking views of its beaches, hills and islands, and is known among travelers as reminiscent of Bali 30 years ago. Located in the southern part of the island, Tanjung Aan is known for its unique, white sandy beaches that resembles peppercorns in shape and texture. It is also conveniently surrounded by hills for viewing the beach from above. Activities available here for visitors include snorkeling, sunbathing and surfing. Visitors can also join the annual Bau Nyale festival in February, when people go out to collect the nyale sea worms that appear only once a year. 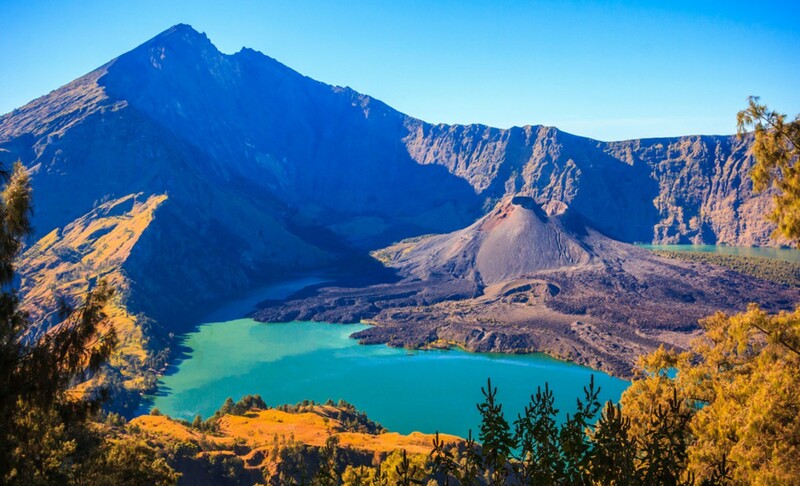 Standing 3,726 meters above sea level, Mount Rinjani is the country’s second highest volcano. For first-timers, fear not, as there are many tour operators available to guide your trip to the top. Do take the time to marvel at the beauty of the blue waters of Segara Anak Lake as you head to the peak. Sunset hunters should definitely visit this hill, which is a popular destination among those keen to photograph the sun setting over Lombok. A short hike to the top will reward you with the gorgeous scenery of the nearby Tanjung Aan Beach and Batu Payung. Traditional culture is well preserved in the villages of Sade and Sasak villages. The houses, for instance, still have thatched straw roofs and woven bamboo walls. Many of the villagers sell tenun (handmade textiles) made from hand-spun cotton and natural dyes. Other than purchasing the fabrics as a souvenir, you can also try to make one using traditional weaving tools. Whether you’re seeking relaxation or excitement, Gili Trawangan, one of the Gili Islands, should be on your list of Lombok stops. As no cars or motorcycles are allowed on the island, you will immediately notice the fresher air.